Please refer to our stock # 11028 when inquiring. This wonderful antique watch pin was made by William B. Kerr of Newark, New Jersey. 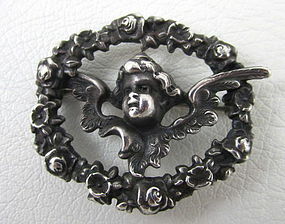 It measures 1 3/8" long x 1 1/4" and has a detailed high relief repousse angel with a border of flowers. The reverse has a hook for a watch and the top is hallmarked "Sterling 924" with the Kerr hatchet hallmark. It is in excellent condition and has it's original "C" scroll closure.